Jeremy Lent is founder and president of the Liology Institute. Jeremy is an author whose writings investigate the patterns of thought that have led our civilization to its current crisis of sustainability. His book, The Patterning Instinct: A Cultural History of Humanity’s Search for Meaning, (Prometheus Books, May 2017), identifies the root metaphors that different cultures worldwide have used to construct meaning in their universe. A cognitive history of humanity, it takes the reader on an archaeological exploration of the mind to reveal the hidden layers of values that form today’s cultural norms. Born in London, Lent received a BA in English Literature from Cambridge University and an MBA from the University of Chicago. His award-winning novel, Requiem of the Human Soul, was published in 2009. Lent’s next book, The Web of Meaning: An Integration of Modern Science with Traditional Wisdom, uses cognitive science and systems theory to interpret traditional Chinese and Buddhist thought, offering a framework that integrates both science and meaning in a coherent whole. ​Jeremy blogs at Patterns of Meaning. He lives in Berkeley and is married to Liology Institute board member Elizabeth Ferguson. Elizabeth Ferguson, Ph.D. is the treasurer and secretary of the Liology Institute. Elizabeth worked in a consulting role for leading technology companies as a usability and research expert for over a decade, helping to improve the end-user experience. Her clients included Google, Yahoo, Intuit, and AOL. Concurrently, Elizabeth obtained a doctorate in psychology and trained in multiple practices in the domains of psycho-spiritual development, somatics, sexology and leadership development. She has integrated these in her roles as professional coach and consultant working with individuals, social entreprenuers and non-profit organizations. Elizabeth is a Bay Area native and received her BA from the University of California at Berkeley and her Ph.D. from the Institute of Transpersonal Psychology. She lives in Berkeley and is married to Liology Institute founder Jeremy Lent. Teja is a director of the Liology Institute. He is the creator of the Radiant Heart method of qigong which integrates traditional Chinese energy practices with the Buddhist dharma. 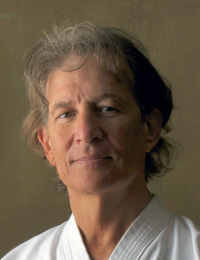 For more than 40 years, Teja has integrated the practice and teaching of martial arts, healing energy practices, and the Dharma. He is a teacher of Aikido (5th degree Black Belt) and of the Chinese Internal Arts, and a fully ordained Rinzai Zen priest and lineage Dharma teacher. Concurrent with his martial arts training, Teja has trained across the three major Buddhist traditions: Theravadan, Mahayana Zen, and Trans-Himalayan Vajrayana. Teja lives in Fairfax, California where, in addition to his energy and dharma practices, he performs as an accomplished guitarist, composing, producing and recording a dynamic blend of acoustic and electronic music.